*We have received this write up from Jack Wright from his TVCC Newsletter. As I look back over the many families of kids I've seen "brought up on the river" over the last 33 years of TVCC, the 9 points listed below ring very true to me. See what you think. I'll bet each of you parents could supply your own examples. Do you bring your kids along on the river, for a "family" activity?? Take, for example, 3 paddling generations of the Walter Popp family, part of them in the picture attached. Several of us charter members taught Walter & Margaret's 3 kids how to paddle, starting in the summer of '67 when they weren't even teenagers yet. As a family of 5, they went on a lot of club trips over the next few years. Son Tom is now an Orthodontist, inspired in part by dentist Doug Graydon, another early TVCC member. Second son Eric is a Presbyterian Minister, now going for his Doctorate of Divinity. Daughter Robin also has an advanced degree, and is a Family Counselor. There are 8 grandchildren! 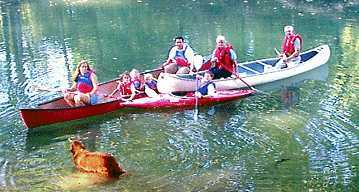 The paddling Popp family: L to R in dark canoe: Starr, Haley, age 7, Selena, age 3, Bryson, age 4, and orthodonist Tom Popp. Colton, age 10, in his kayak. Charter TVCC members Margaret and Walter, in their original white Blue Hole #39, off Tom's back yard on North Chickamauga Creek. (1)-Whitewater fosters a Healthy Relationship between parents and kids. Travelling, paddling, camping, and cooking together. Other adults and kids are in the club "group" on the river too, also practicing these relationships. Don't be just a chauffeur to your kids as they grow up. Mr. Gedekoh says kids today are drowning in an ocean of their peers, lost in large impersonal schools where order is hard to maintain. No personally-known role models. Some experts say kids should spend time with their own age, so they'll learn how to act. What?? They should be in groups that include related adults, who are teaching them by example, how to act, as adults! (2)-Whitewater gives kids Something in Common with their parents, to talk about, to share. How did we survive that last rapid? Now compare with soccer or baseball. Do mom and dad also have the opportunity to hit a home run or kick a goal? Have you seen the news with those sideline fistfights breaking out among the parent-chauffeurs? They ought to be taking lessons about temper from their kids. I wonder what positive lesson the chauffeur with the black eye taught on the way home? (3)-Teens usually get good at whitewater quickly. Parents are then Proud of their kids, and want to show it. (4)-Confidence and Self-Esteem often grow fast in these kids. Remember when your first 2' waterfall on the Hiwassee sounded like Niagara Falls? Then you went through it, and how did you feel? You wanted to do it again. We all remember our first time for that. (5)-The Odds of Top Success in a sport are much better of being a world champion in a kayak than playing a pro sport of some kind, but most kids today still dream of being Chipper Jones instead of Scott Shipley, or Marion Jones instead of Cathy Hearn. (6)-Kids don't have to be Big in Size in this sport. It's agility, brains, and judgement, not size. Some say WW is dangerous, but there are really very few injuries or fatalities among kids, compared to hundreds of disabling injuries every year in high school football. (7)-Whitewater is a great Responsibility teacher. There are shuttles to plan and schedule, food, clothing, and equipment to inspect and remember. (8)-Kids learn to Stay Cool when things get tense. They learn to make their own decisions and set proper and safe limits for themselves. They learn not to whine when they are cold, wet, and hungry. The adults around don't do that (much), so they learn what it takes and how to act as an adult. Such kids are fun to be around. I remember teaching a Venture Scout mixed group of teens from my son's church, just a few years ago. We camped at Gee Creek, and paddled the Hiwassee. On the way there we listened to their rock group CDs, and on the way back, they listened to my '50s and '60s Beach Boys, Peter Paul & Mary, and John Denver CDs. They knew a lot of "my" classic songs. They were great fun. (9)-We are helping to create the River Stewards of the future. Do we really want to keep existing free-flowing rivers the way they are? I want my son and his son to wade in the same clear, cold Hiwassee water as I have enjoyed, the same as my uncle Bill Workman did in 1930.